We're building a legacy of safety one milestone at a time. Here are some of the achievements CAPE is pleased to call our own. 1998 Performed first barrier crash test with a commercial truck. 1999 Conducted the first bus-to-bus crash performed in the U.S. in three decades. 2002 CAPE conducts full scale frontal impact crash test of IndyCar racing car. 2004 CAPE conducts full scale rear impact crash test of IndyCar racing car. 2007 CAPE certified as an FIA test house. 2010 First test house to test the effectiveness of seat belts on motorcoaches. 2011 CAPE expands to a 49,000 square foot facility. 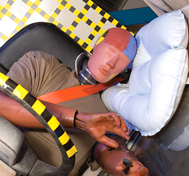 2011 CAPE wins Crash Test Facility of the Year award. 2012 CAPE partners with IMIS for a series of events designed to improve driver safety in motorsports. 2013 CAPE hosts two school bus crash events with local media and insurance professionals to demonstrate school bus safety. 2014 CAPE drops a Sprint car from the ceiling in a test for the Performance Racing Industry. 2015 First “real world” rollover testing at CAPE that allows for 180-degree rolls and beyond. 2016 CAPE hosts tractor trailer rollover event for trucking industry leaders to demonstrate the RollTek side roll protection system. 2017 CAPE and IMMI conduct a school bus side impact crash demonstration for the SafeGuard Seat Belt Safety Summit.